When designing and installing a green roof, it is important to provide a growing environment as close as possible to the plant's natural environment. The most important factor is to compensate for the lack of subsoil. Each layer of a ZinCo green roof build-up is conceived to take over the relevant functions of the missing ground. A durable plant coverage is guaranteed. Extensive roofs are an ecological alternative to conventional surface protection or ballast layers such as gravel and pavers. They are lightweight and have a shallow build-up height. Suitable plants include various Sedum species, herbs and some grasses. They cope with the conditions on the roof (sun, wind, drought, etc.) by nature. After establishment of the vegetation, the maintenance is limited to one or two inspections a year. Intensive green roofs can most easily be compared to building a garden on a roof. They are usually multifunctional and accessible. They require more weight and a deeper system build-up. The maintenance is regular and depends on the landscape design and the chosen plant material. Depending on the substrate depth, anything is possible from lawns, perennials, shrubs, trees including other landscape options such as ponds, pergolas, patios, walkways and driveways. For all these kinds of use ZinCo provides well-engineered longlasting and functioning systems. ZinCo is leading in the development of tried and tested fall protection systems on roofs that do not require the roof membrane to be penetrated as well as solutions for combining solar energy plants with green roofs. Elaborate system build-ups focus on rainwater management and counteracting Urban Heat Island effects. “Sedum Carpet” is a shallow and lightweight green roof type that can easily deal with sun, wind and drought and requires little maintenance. The green roofing system “Rockery Type Plants” leads to an extensive green roof with sophisticated design and individual character. 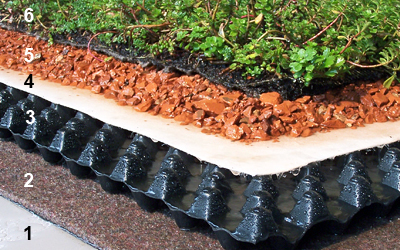 Floraset® FS 75 is the perfect drainage element to install a green roof on a sloping roof up to 25°. It prevents erosion and safely transfers shear forces. Our highly sophisticated green roofing system with Georaster® elements even enables the installation of steep pitched roofs up to 35°. Thanks to a a high level of evaporation the ZinCo green roof system “Urban Climate Roof” helps cool cities during hot, dry periods. Learn more about how to foster the biotope function of greened roof areas, thus providing habitat for flora and fauna. “Heather with Lavender” is the ideal green roof system build-up for growing a wide variety of blooming perennials, aromatic shrubs and ornamental grasses. 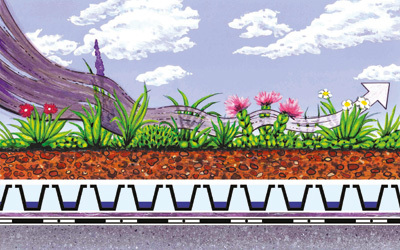 Roof Garden with Aquatec® allows for visually appealing prestigious designs with lawn, perennials and shrubs on roofs with a limited load bearing capacity. Our top quality roof garden system offers high water storage and allows for a variety of design concepts including walkways, water features, patios or play areas. Enjoy fresh vegetables and fruits from your roof! 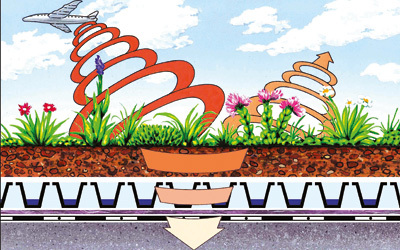 ZinCo provide a system build-up with proven drainage technology for growing vegetables on roofs. Lawns can be established on roofs using seed or turf just as they can on the ground. Read more about appropriate green roof system build-ups. Green roofs can be combined with paved areas for recreation or sporting surfaces. ZinCo provide well-engineered systems and accessories for all kinds of use. ZinCo driveway systems meet all requirements and ensure durable functionality for use under driveways, fire brigade access or parking areas on rooftops and podium decks. ZinCo provide a well-engineered stormwater management roof system, designed to detain stormwater and release it in a pre-defined period. ZinCo provide various well-engineered fall protection systems for working on the roof which do not require any penetration of the roof membrane. Prevents roots from penetrating the roof membrane. 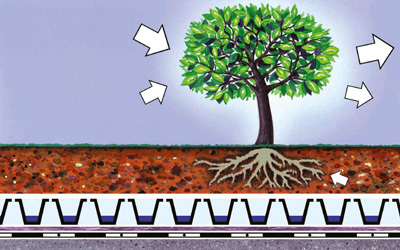 Only necessary if the waterproofing is not root resistant (FLL certified). Provides mechanical protection to the root barrier and retains moisture and nutrients. Retains water in troughs on the upper side whilst excess water drains away safely through the channels inbetween. Strategically located holes provide the necessary aeration of the root area. Prevents fine particles from being washed out of the substrate soil, thereby ensuring the efficiency of the drainage layer. Engineered growing medium based on minerals and organic material. It suits the needs of the green roof vegetation and provides for a stable growing environment. Varieties of plants selected according to climate, landscape design, load bearing capacity and desired benefits to building owners and communities. Green roofs cool and humidify the surrounding air. Thus, they create a beneficial microclimate within their immediate area and contribute to improving the microclimate in urban centres. 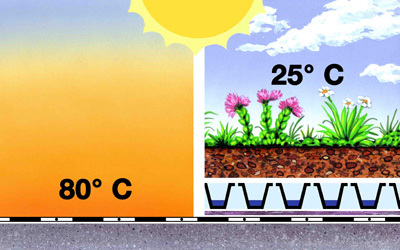 Coordinated urban green roof development can significantly reduce the so-called “Heat Island” effect. 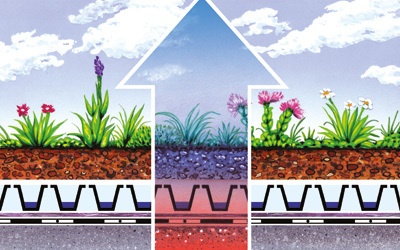 Planted areas are natural sound insulators and absorb more sound than hard surfaces. Green roofs reduce reflective sound by up to 3 dB and improve sound insulation by up to 8 dB. This is very effective for buildings near airports, noisy nightclubs and factories. Landscaped roofs compensate for green spaces, which are lost to building development. 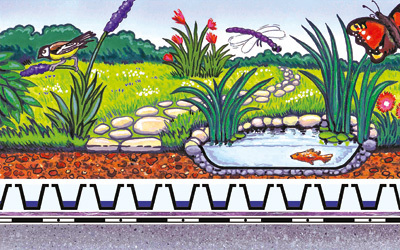 They provide natural habitats for wildlife and bring nature back into the cities. 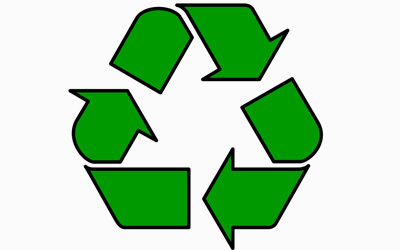 Green roofs make extensive use of recycled and recyclable products, saving further valuable resources. Rubber, polyethylene and expanded polystyrene rigid foam are used in the production of drainage elements. The mono clay material Zincolit® and humus are the basis for the production of ZinCo rooftop garden system soils. The most important criterion is the quality of the product, which is tested by recognised institutes and research bodies. 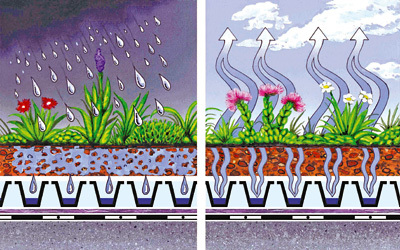 A green roof can reduce water run-off by 50–90 %; any remaining water flows from the roof with a delay. Outlets, pipes and drains can be reduced in capacity, thereby saving construction costs. Sewer costs can be reduced in some areas. A green roof protects the waterproofing from climate extremes, UV exposure and mechanical damage. This greatly increases the life expectancy of the waterproofing and results in reduced maintenance and replacement costs. A green roof has the ability to buffer temperature extremes and improve the buildings energy performance. Converting or designing normally unused areas into green roofs, particularly for recreational or sporting use not only makes use of expensive space, but saves the costs of purchasing additional land. Green roofs often assist in gaining planning consent.